Baer, Wolf, and Risley (1968) indicated “technological” was one of seven core dimensions of applied behavior analysis (ABA). They described this dimension as being met if interventions were described well enough to be implemented correctly. Often in the applied settings, a behavior plan is the method by which interventions are communicated to staff and parents for implementation. The necessary components of a behavior plan have been discussed in relation to compliance with regulations (e.g., Vollmer, Iwata, Zarcone, & Rodgers, Research in Developmental Disabilities 13:429–441, 1992), in school settings (e.g., Horner, Sugai, Todd, & Lewis-Palmer, Exceptionality: A Special Education Journal 8:205–215, 2000), and other applied settings (e.g., Tarbox et al., Research in Autism Spectrum Disorder 7:1509–1517, 2013) for the last 25 years. 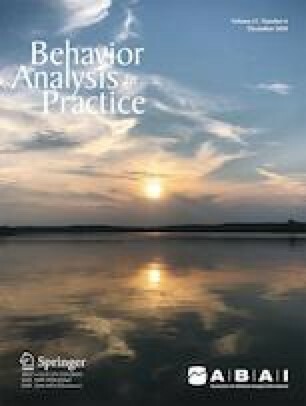 The purpose of this research is to review the literature regarding components of behavior plans and synthesize it with a recent survey of behavior analysts regarding essential components of behavior plans. The results are discussed in light of training, treatment fidelity implications (i.e., Registered Behavior Technician Task List), public policy development (e.g., state initiative for a single behavior plan template), and research opportunities (e.g., comparison of different visual structures). This research was supported in part through the Behavior Analysis Certification Board (BACB). The Behavior Analyst Certification Board distributed the survey to all registrants allowing solicitation for no cost. One author, Alissa A. Conway, is part of a team consulting with the state of Michigan to develop a uniform behavior plan template. She is not compensated for her consultation time. The Beacon Services internal review committee reviewed this research protocol and indicated that it did not pose any significant risks to participants.